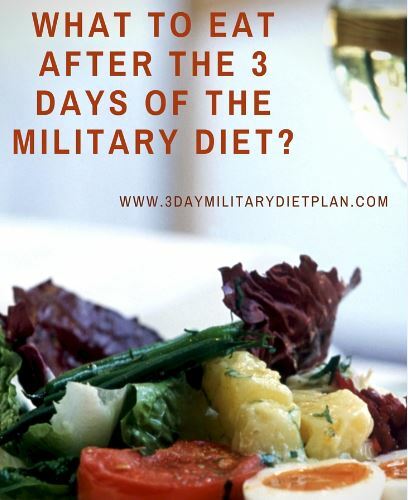 We get lots of questions about what should someone eat after they have completed the 3 days of the three day military diet. It isn’t healthy to start the diet over every 3 days. And starting the diet over can slow the bodies metabolism because it is a low calorie diet. Being on a low calorie diet can also cause Dieter’s Fatigue. So what to Eat After the 3 Days of the Military Diet? The overexertion of willpower used on a diet that causes the dieter to break the diet. Normally the diet is broken in a big way that can involve unhealthy eating, binge eating, and/or the “yo-yo” effect. Many like the military diet because of its simplicity. It tells you exactly what to eat and for what meal. The diet really is a weekly diet but it has a strict diet for only the first 3 days of the cycle. The 4 days off are a little more ambiguous. If we look at the language of the diet it tells us that the 4 days after the strict eating regimen should be accompanied by “maintenance eating” or that we should “eat normally”. Well if we were gaining weight to begin with maybe “eating normally” isn’t the answer. The 3 days of the military diet are very low calorie. For that reason strenuous exercise is not recommended. We do however recommend light exercise. We are big fans of walking. Walking is great on the diet and is great when you aren’t on the low calories of the 3 day plan. When not on the 3 day plan try walking 5 miles a day. Walking 5 miles a day is much easier than it sounds and is one of the easiest ways to lose weight simply because of the fat that is burned while walking. Most fat is burned during low strenuous exercise. If you are inclined to go out and do short distance sprints or high intensity/heart rate workouts like stairs or rowing then by all means you should do it. But is isn’t necessary for weight loss. Simple good ol’ walking will work just fine. We talk a lot about water. If you get enough sleep and only drink water instead of juice, sports drinks, or soda (yes even diet soda) you are already ahead of the game. Lack of sleep and calories through beverages are the biggest obstacles to losing weight and keeping weight off. When are most people likely to overeat? During a meal right? That is because our brain and stomach aren’t linked up too great. The stomach is slow to tell the brain that is full. The average time your brain needs to realize the stomach is full is 20 minutes. Try drinking a glass of water before each meal. This gives you the stomach a head start on sending those signals to the brain that it is full. Also try not to eat to fast. Give your stomach time to tell your brain that food is in your belly. If you really are hungry you can come back and finish the job. Water is the universal solvent and without it there would be no life on this planet. Water is what your body needs to flush out toxins. Water aids the digestive process. Lack of water in the body is even linked to brain deficiencies and memory loss. There is even some science behind only increasing your water intake to lose weight and doing nothing else. Studies have shown that lack of sleep increases weight gain. The opposite also appears to be true. Getting enough sleep can aid you in weight loss. When you don’t get enough sleep at night it sets your brain up to make bad decisions. Lack of sleep can dull activity in the brain’s frontal lobe, the locus of decision-making and impulse control. Basically it can be a little like being drunk. You simply don’t have the mental clarity to make good decisions. When you’re overtired the brain makes bad decisions. We’re not entirely sure why we need sleep. One theory is that sleeping helps replace the chemicals in your brain that is needed for it to function. When you don’t sleep and replace these “brain chemicals” it can affect everything you do throughout the day, normally not in a positive way.With lack of sleep the brain’s reward centers are looking for something to help it feel good. We may have no problem resisting craving when we have enough sleep. But a brain low on sleep can make impulse and rash decisions. The delicious chocolate cake at the neighbor bakery might be the only thing a tired brain can think about. A tired brain uses a lot more willpower than a well-rested brain. A tired brain doesn’t ask what to eat after the 3 days of the military diet. When you are tired you aren’t thinking about your long-term goals and how important it is for you to lose weight. A tired brain wants pleasure now. So we’ve established the we should drink lots of water, get plenty of sleep, and do some light exercise. What should we eat? We believe that diets can help you shed some extra pounds but you can’t be on a diet perpetually. The ideal weight loss program isn’t a diet. And that is why we need to change our lifestyles if we are going to be fit forever. The rules says we should eat normally. If you are on a slight calorie deficit each day then you are golden. There is nothing more that you need to do. If you don’t even know how many calories you burn each day or haven’t figured out your basal metabolic rate or don’t want to count calories then here are some ideas for meals. If you eat these and only these meals you are guaranteed to keep the weight off that you worked so hard to get off on your 3 days of the strict regimen. The above food ideas came from an article online about healthy meals. You really should experiment and do what works for you. The best advice we have is to drink lots of water, get lots of sleep, and do a light exercise. Also the single biggest life altering thing you can do is only eat when you are hungry. Thanks for sharing your thoughts. I really appreciate your efforts on writing this all out. I guess I didn’t realize that the 4 days off were so important. I had never heard of dieter’s fatigue. I defintely know what it is, I just didn’t know there was a term for it. I am just starting to learn about all of this. Thanks for your help! Has anyone lost weight on the 4 days off? Or is all you can hope to do is maintain your weight loss? I lost 9.6 and gained 2 ozs . On the four days off. Just need to learn to pick my foods and portions . I’m sorry meant to say I gained 2 pounds. I wish I could speed up time. I understand they cycle of wanting to stay healthy and not going crazy 7 days a week. But it is hard when you really get motivated to shed those pounds! it! I would love to know your personal experience on the diet. Many thanks, quite great post. I believe I’ve tried every diet on the book nothing has helped me. I heard about the military diet looked it up the foods it has I like to eat decided to try it just to see if it was true. Well to my surprise I lost 9.2 pounds without exercising and drinking a gallon of water a day. So I decided to do it for another 3 days, I will weigh in tomorrow morning hoping I lost a few more pounds. I also have health issues and cannot move much. I believe avoiding refined foods (regardless of the diet) will be the first step to help lose weight. They could taste great, but ready-made foods currently have very little vitamins and minerals, making you try to eat more in order to have enough vitality to get through the day. If you’re constantly consuming these foods, switching to whole grains and other complex carbohydrates will make you to have more vitality while feeding on less. Great blog post. Thank’s love this great post. Good article! We shall be linking to this great post on our website. I read this post without fully knowing why it was important to take the few days off. Thanks for explaining why we take 4 days off this diet (apart from it being hard). Not many advocate the 3 day military diet having the essential compenent of 4 days off. I guess it is true that I didn’t gain all my weight in a few weeks. I shouldn’t expect for it to magically disappear in a few weeks. That still makes is hard though! Why only 4 days off? Why not 2 or 3 or 11 days off? Appreciate the recommendation. I’m going off script and will do the military diet without the 4 days off. Edit comment: Not taking 4 days off is really really really really hard. I’m on Day 2. Day 1 was no joke! I’m only going to measure my progess week to week because I also think the 4 days off are important. So true. Take a break folks! Haven’t you seen what the Rock eats on his cheat days? It’s ridiculous! How come no one else talks about taking it easy for the 4 days off? Why is this the only site that advocates doing things slow? Is there a benefit to that? Yes! Taking days off on the diet is sooooooooooooo important!!! Any books you would reccomend on the diet or what to do after you have lost the weight? This post had all of the information I needed. I was afraid to ask about the days off. We can’t just keep dieting forever right? Has anyone done a mini-diet on their 4 days off? I’ve cycled through the military diet for almost a year now. I’m down 43 lbs. just from January of 2016. I have also been walking 2-3 miles a days. I think that is a big part of it. I know my doctor is happy about the results. I still feel like I have a long way to go though. Wish I would have found this site last time I tried the diet. Everyone pretends that it’s easy and that you should go low calorie almost indefinitely. Nice to see some reason otherwise. I think you’re wrong on substituations though. I’ve done that very successfully. Took a while for me to figure this out too! My bf lost 33 pounds on this diet but never took any days off. I’ve tried not taking the 4 days off. Absolutely not worth it. How about taking a week off? That’s what I’ve done. but have never really watched what i eat, my weight gain came about 2 years before my baby. A lot of it i can attribute to late nights with friends drinking. the weight just crept up fast 50pds in about a year! I had a hard pregnancy due to having gestational diabetes, it was scary and didn’t feel great , the good thing is as soon as i gave birth my blood sugar was back to normal. I only gained 13 pds while pregnant and lost it all , but did not lose anything else since then. I would like to have another baby but know i its very risky so thats why i hope this diet works! this was my first round of the 3 day military diet, when you are not used to watching what you eat and your calorie intake it can be hard , but I think if I wasn’t making sure to drink half my weight in water i’d feel very hungry. So far i noticed a change how i feel ( less bloated) also have more energy because I’m not eating crappy and I’m drinking plenty of water. I have only been waling like 30 min a day, but its a start to get back to exercising. I hope to finish 3 rounds back to back of the military diet this month and see how it works. I hope to incorporate 1 cheat meal every sunday night ( NOTE : CHEAT MEAL NOT CHEAT DAY) Please wish me luck , as i wish all of you the same! Hi Jay! Thanks for sharing your story. The diet gets easier when you start to see results. But that can be a few days or a few weeks for some people. And thank you for drinking water! For me it was easier to get on the diet than to deal with my extra weight. But killing those urges can be really hard in the beginning. I thought I’d never get off Doritos! I’m glad that you are obeying the cycles. Those that repeat the diet without any days off are the ones that burn out quick. The weight will come off especially if you are walking a little every day. The best of luck to you! Let us know how it goes.